The perfect team — our stylists have been trained with the highest industry standards. With more than 35 years of experience in the wellness and beauty profession, Lorrene Conino has earned a solid reputation in the community. Over the last 20 years, Conino has developed a comprehensive background in exceptional customer care, the highest level of staff training and development, leadership and management. As an innovative stylist for over 35 years, Lorrene Conino has created Salon Lorrene. Her talents include the art of dry haircutting. Dry haircutting gives you the flexibility to work with your hair’s unique fabric. Lorrene also has an extensive background on hair color, including being trained by the best early on in her career. Lorrene worked as a salon educator as well as working many trade shows with some of the best artists in the salon industry. she believes in education for constant inspiration. Halina’s amazing cutting technique reflects her 20 years of experience in the industry. She excels in both short and long hair styles, as well as precision cuts. Her expertise in coloring, foiling techniques, perms, and Keratin Smoothing Treatments are top in the industry, along with her expertise in formal and Bridal updo’s and styles. Halina’s personality brings flare to her cutting and coloring creativity. Rest assured, you will get her total and undivided attention during your consultation. Her goal is to exceed your expectations. Vanessa LOVES HAIR! This is her passion! She has been part of the Salon Lorrene team since 2000. She attends classes every year to keep her on the cutting edge. Her education includes classes with Prive, Aquage, and the Redken Master Stylist program. She has also attended classes in New York for Wella. She enjoys creating new looks and giving her clients a boost of confidence. Lauren is a master colorist and stylist. She has been with Salon Lorrene all of her career beginning in 2002. Lauren specializes in heavy foils, blondes, razor cutting, and adding dimension into your style! Lauren also loves to work with curly hair, another specialty of hers. She is a certified Redken specialist along with very advanced education with Aquage, Wella, and All-Nutrient. Lauren is a very devoted and creative stylist who will go above and beyond your specific needs. Stacey is a master colorist and stylist with over 12 years of experience in the industry. Her specialties include expert highlighting and color techniques, as well as precision hair cutting. She loves doing various haircuts from long hair to short hair. Stacey is very service oriented and will focus on the client and their individual look. She has taken numerous classes including Redken, Wella, and Aquage. Being a highly motivated individual, Shay strives to keep up with the latest trends as well as continually perfecting her skills in classic timeless hair designs in both cutting and color. Communicating is Shay’s high point which enables her to create the look her clients desire at the salon, as well as giving them the confidence and tools to make their hair look just as beautiful at home. Shay is one of the salon’s master stylists specializing in Balayage and Blondes! Shay has attended many top reputable classes and shows such as Wella and Aquage. Kathy has been in the industry for over 18 years and has taken many advanced classes in Aquage, Wella and Redken. She takes pride in understanding the clients needs and specializes in texture, dry cutting, coloring, and curly hair. Kathy strives to achieve the best hair for her clientele by using their head shape, facial features, and educating them on how to recreate their style. Let Kathy show you how to love your hair! Kristin grew up in a salon atmosphere and always knew she wanted to do hair. She has attended the Midwest Beauty Show every year since being a stylist to stay up to date on new trends and styles. Kristin has been a part of the Salon Lorrene team since 2008. 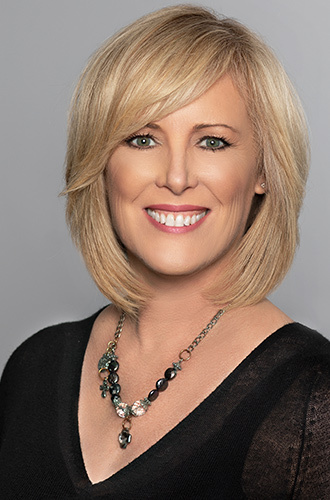 Kristin has attented multiple academy classes on cutting and styling with Aquage, is certified in the Global Keratin Smoothing Treatment, and attended the Color America seminar in Nashville, Tennessee. Her expertise lies in styling, color changes, ombre color, and men’s hair cuts. Kristin enjoys making people feel better about their look and confident with themselves. Amanda has had a passion for the hair and beauty industry most of her adult life. She mastered her hair color, styling, and cutting techniques through training at Pivot Point International Academy. Amanda believes in continuing her education and has trained at the Aveda Institute learning advanced coloring and cutting techniques. She also had extensive training with Bumble and Bumble, Rusk, and Wella. She is a highly motivated individual and has a passion for making everyone in her chair look and feel beautiful. She is always on top of the latest hair styles and trends and is always comfortable with trying new things. Amanda specializes in highlighting, balayage, ombre, and flamboyage. She enjoys treating all of her clients as family where they receive great service and attention. Breanna has been a hairstylist since 2011 and with Salon Lorrene since 2013! Breanna’s passion for hair began at a young age. She is certified in the Global Keratin Smoothing Treatment and is constantly keeping up with the latest trends and techniques by attending regular classes by Aquage, Prive, Ergo, and Aveda; including the America’s Beauty Show every year. She went to the Aquage Academy for cutting and styling in Chicago, and an exclusive Intercoiffure event in New York City. Her specialty is styling and it is her mission to have you leave the salon feeling more beautiful than when you walked in! Ready for a new you? Sharon has been wowing clients at Salon Lorrene with her exceptional attention to detail and customer service skills since 2002. Sharon will work with your hair-type, face shape, and lifestyle to create a total hair transformation. She specializes in custom cuts with excellent styling and product education. Sharon is an expert in detailed dry hair cutting and has perfected her craft with training and education from Aquage, Aveda, Davines, Wella and Prive. Sharon will give you a one of kind look that is both wearable and trendy. Tania brings 18 years of mastered styling skills to her clientele. Her educational experiences include top training in the hair styling industry from cutting edge professionals such as; Davines, Aquage, Wella color, Redken, Vidal Sasson, Prive, Matrix, and Crew. Also certified in tape in/beaded extensions and smoothing treatments. She has Worked in New York fashion shows as well as meeting and learning from some of the most influential hair stylist in the industry. These experiences keep her current, fresh and creative as a styling artist. Tania welcomes the opportunity to pamper and create an award-winning look to help maintain your sense of beauty, style and individuality. She accomplishes this with each of her clients by sharing her passion for staying updated and trained in the most progressive skills in the hair styling industry. Tania keeps her clientele updated in the art of color corrections, fine hair, texturizing and color formulating. Whether a simple change or a long-term hair goal, know that you will be cared for expertly! Shannon has been a Senior stylist for over 15 years. Although her passion lies in color and cutting, she is highly skilled with updo’s and styling. Kylie was born into a multi-generation of hair stylists. Her passion and artistry flourished as she studied at the Aveda Institute of Chicago. She is trained in the latest color formulations; high-lighting, balayage and color correction. Kylie stays relevant by participating in hands-on courses which incorporate the latest trends. She uses a highly precision cutting approach personalized to her client’s unique style. She specializes in a variety of up dos and braids, tape-in/beaded hair extensions, matching and blending colors to make you look and feel rejuvenated. Professional, yet approachable and enjoys engaging with her clients. You’ll feel comfortable in Kylie’s hands and become educated in recreating your style at home. Since 1998 we have been training our future Stylists. Stay tuned as we have our two next generation in training!